Little Noah was born prematurely in December 2012, and more recently was diagnosed with a rare medical condition that has impacted his development. 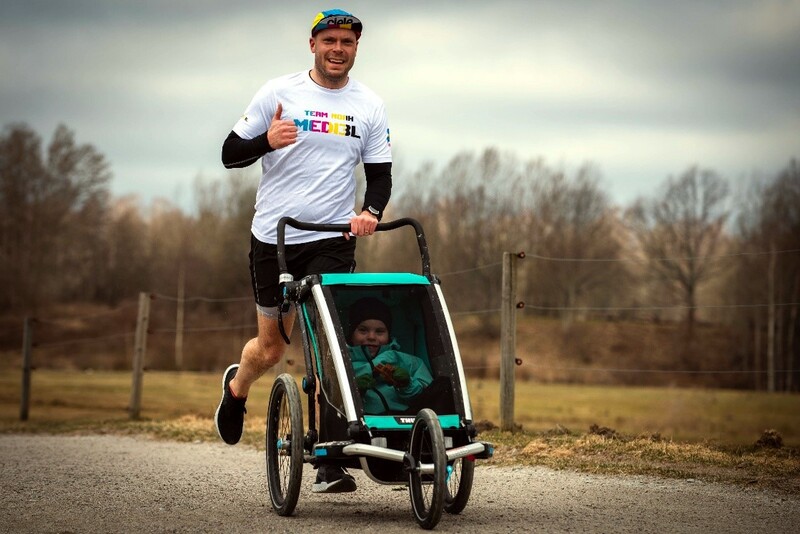 Here his Dad Daniel tells the story about Noah’s young life, how he hopes to support other families in a similar situation, and how parkrun has helped Noah’s social skills in dealing with large groups of people. Many of you have probably seen the guy behind the black net in the blue-green running buggy, but who is he really? In order to get to know him properly, we have to go back to a Saturday morning, December 2012. Due to some complications, we travelled in to the maternity ward worried about the birth but hoping that we would be sent home to our two older children again, with a reassuring message. Unfortunately, it was just the opposite. Noah was born with an emergency caesarean, five weeks early and it was a lifeless little body which was carried out from the operating room. 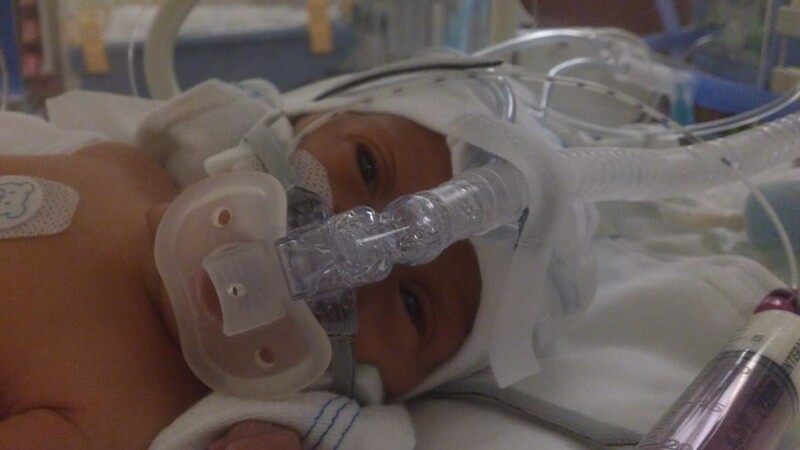 The doctors and childbirth staff worked feverishly to get his breathing started and to find a steady heart rate. After, what felt like an eternity, they succeeded. He then spent a while in the neonatal ward until his basic needs, such as breathing and eating, were working OK. When Noah did not reach the normal growth curves during childhood, we were first told that he was lagging behind in the development due to the premature birth, but he would soon catch up. Sure, he learned to walk, but didn’t take his first, wobbly, steps until just before his second birthday. Roughly at the same time he could say a few words, like “mummy”. He could also imitate simpler sounds and movements and point to the lamp when he was asked. We were happy, he was developing! But then one day, just like that, all that knowledge just seemed to disappear. The doctors explained that the motor skills that he had developed could just regress for a while. But it never came back, not even until today. 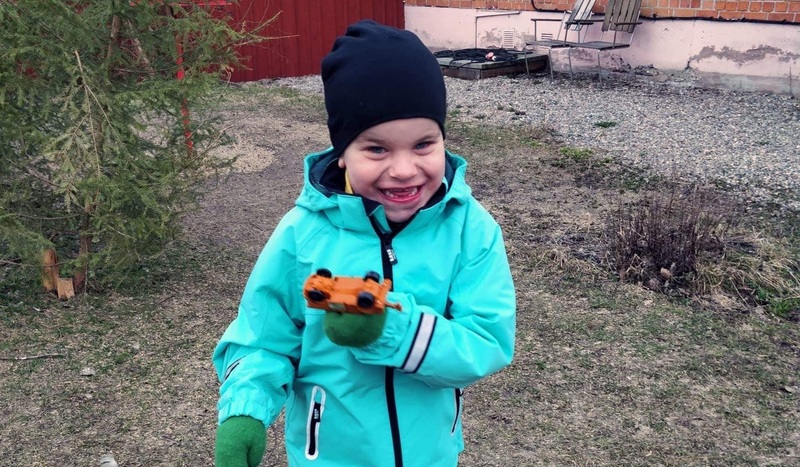 At the age of 3.5 doctors started undertaking tests on Noah, among other things to exclude metabolic problems. The metabolism looked good, but the blood test had shown a hit in an international database, something called MED13L had been found. A short explanation: a chromosome aberration consisting of a deletion on chromosome 12. The geneticists at the Academic Hospital in Uppsala had never encountered this and there was no one else in Sweden, at the time, who had the same condition. Noah was first. Information was sought, but the little that was found was written in English or French in medical terminology, so it was difficult to get an overall picture of what we could expect. Then a struggle began to get enough support at preschool, but with only the diagnosis of MED13L this was difficult, as no one knew what that meant. But when Noah was very fixated about some things and showed a repetitive behavior, an autism investigation was prioritised which came back with an autism diagnosis. Things started to happen, adjustments were made, and Noah received a resource person and specialised teaching at preschool. Prior to the postponed school start this fall, a larger investigation was also made for the right for placement in a special schools, the outcome of which was that Noah has developmental disability at a high level. Most likely it will be placement in a specialist school – the answer to that we will have in a few weeks. Noah loves to ride in a buggy or sit on a bike seat and this often has a very calming effect on him, as long as it moves. At first we took him out when he was mostly frustrated, when he had a temper tantrum, or when he bit or scratched someone in the family. A little bit like a ‘time out’. 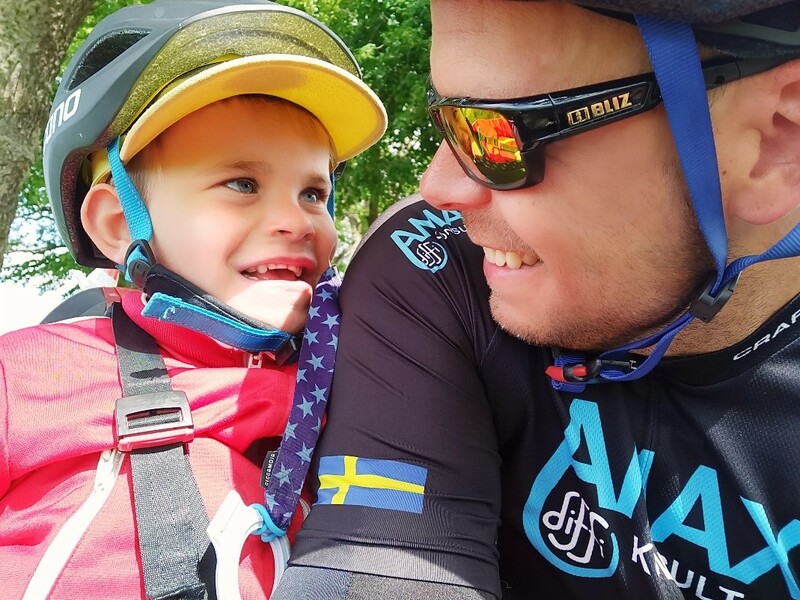 It later happened that almost all my running and cycling was with Noah. Inspired by Team Nordmark, finally came the idea of a team. Maybe we could highlight MED13L and thus help other families who get the diagnosis, so they might not have to feel alone as we did? There are three confirmed cases now, of which one family in southern Sweden has contacted us. 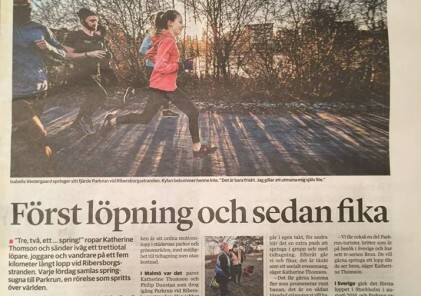 Noah has always had trouble with crowds, so it was with some concern we participated in Örebro parkrun for the first time last year. Noah clearly showed that he was not particularly fond of the set-up and the first few times we were at the very back with the running buggy turned away from the group, but over time we could approach the group more and more. Now it works to stand wherever we like and Noah runs around happily after we reach the finish line and is curious about other runners, it feels like he is part of the group now. 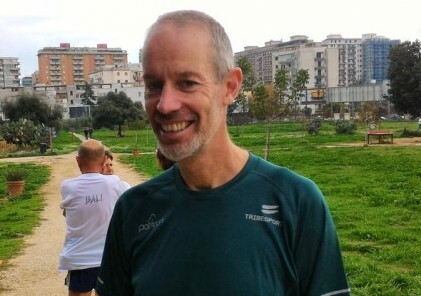 Since we started with parkrun, Noah has developed hugely, especially in social contexts. Perhaps it is a maturation process, but I am convinced that our participation in parkrun, together with others in a group of just the right size, has been a contributing factor to this. Come over and cheer for us – however, Noah will not cheer back as he can’t speak and does not wave. But if he is “exposed” to it, then maybe this will also develop, who knows? And don’t be afraid to ask questions if there’s something you’re wondering about, we are completely open with everything to do with his condition. If you want to follow us in social media, you will find us by name @NoahMED13L.